Ghana stands of earning close to 230 million cedis every year should the country adopt the nitrogen efficient developed rice variety annually, an economist and a research Scientist with the Center for Scientific and Industrial Research (CSRI) Dr Paul Boadu has said. An economic assessment by Forum for Agriculture in Africa (FAFRA) Dr Paul Boadu said also indicates that, consumers stands to benefit in the area of price reduction. In the Volta region for instance where rice production is currently high, it stand to gain a net benefit of about 380 million cedis whilst Northern region benefit stands at about 199 million annually. The adoption of the Biotech crops, Dr Paul Boadu explained will help the country to address the nutritional in balance. The nitrogen efficient rice the scientist said is able to utilized nitrogen from the atmosphere and also able to withstand climate change (drought resistance). Scientist he said, has observed that, most of the rice produced in Ghana are from the lowland base but due to climate change and effect of droughts, the fringes are not able to do well. Farmers he said, stand at a high chance to benefit more from the new varieties. 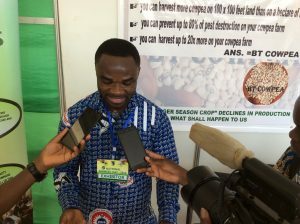 On the BT cowpea, Dr Paul Boadu said when it is adopted, there will be a reduction in production cost as well reduction of prices from farmers. The country stands a chance of gaining about 578 million cedis annually should farmers adopt BT cowpea.